The item Daisy Miller represents a specific, individual, material embodiment of a distinct intellectual or artistic creation found in Evansville Vanderburgh Public Library. 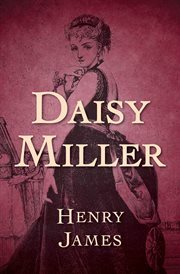 Daisy Miller, a young American girl, flirts and partakes of young life to its fullest while visiting Europe. Daisy meets the more subtle and self-aware Winterbourne and their romance ends in misfortune.